Before we get to the conflict and intrigue, let’s look at the basics of this new approach to buying electricity. 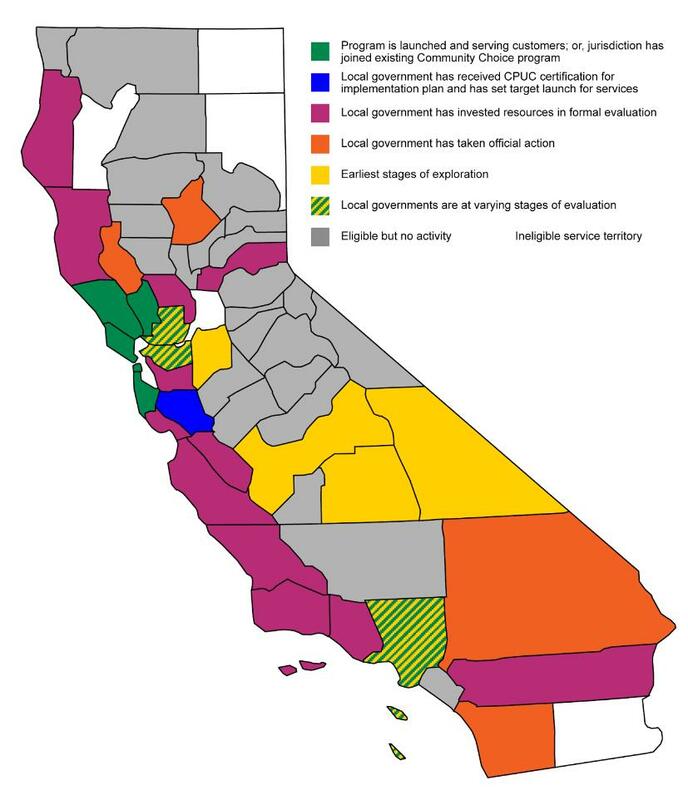 Community Choice Energy (CCE), also known as Community Choice Aggregation, is a way for cities, counties or regions in California to look out for their own energy interests, a hybrid between regulated and deregulated electricity supply. The local utility still provides all of the billing services and infrastructure to supply electricity to the point of use, but they are no longer responsible for selecting the electricity supplier. Instead, the community chooses its energy supplier. Possibly the best part of a Community Choice Energy program is that it allows us choice. While CCEs across the state offer electricity with significantly more renewable content—and at lower costs than the utility—customers can still choose to stay with the status quo. No one is required to buy CCE power, anyone can opt-out. By example, let’s look at an actual program. 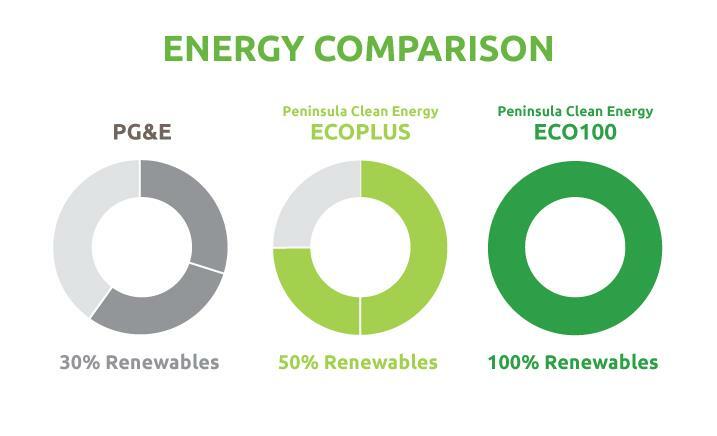 The newest Choice program in California is Peninsula Clean Energy (PCE) in San Mateo County. It includes the 20 cities therein as well as the unincorporated areas. In that program, rates are slightly lower than PG&E rates even after an additional fee the utility charges for departing from the standard system, called a Power Charge Indifference Adjustment (PCIA). For the average PCE customer, the fee is $10.61 per month. But despite this additional cost, the overall CCE electricity bill is still less than with the current PG&E offer—and customers receive 67% more renewable content in their electricity than with PG&E’s standard mix. But it gets better: the CCE program provides another choice: 100% renewable energy. Currently, that option only costs 3% more than PG&E’s standard offer. In response, PG&E has begun offering a 100% renewable service too. Competition is already bringing about positive change. I just threw a lot of numbers at you, so I’ll summarize. CCEs can provide cleaner, cheaper options than utility energy and all we need to do to get it is ask. Currently, the City has taken the first step in the process towards a CCE, commissioning a feasibility study that is scheduled to be released mid-2017. With five successful programs up and running in California and two more starting in the first half of 2017 it is not unreasonable to ask if a feasibility study is really still called for. Unfortunately the first step is still a feasibility study. Without one, SDG&E’s first talking point would likely revolve around the idea that a county or city is jumping into the shadowy unknown without so much as a flashlight. Undoubtedly, the results of the city’s study will echo the many studies before it and find that CCE will be beneficial for the region. Introducing a new process for purchasing energy means that San Diego Gas and Electric will lose the part of their revenue made from procuring electricity. While the utilities are not supposed to profit directly from electricity sales, they find ways to benefit from it. For instance, they structure power purchases to benefit infrastructure projects, where they do profit. More importantly for the utility, their monopoly over energy sales disappears. A CCE program gives consumers a choice between two major options instead of none. Then, as mentioned above, the two top level options, CCE or utility energy, divide even further allowing customers to select from a portfolio of renewable energy options. Without competition, electricity prices are determined bureaucratically. The utility charges as much as the California Public Utility Commission (CPUC) allows regardless of whether or not those charges are above market prices. But once a CCE program is in place, every consumer can see true market prices. That means not only will the CPUC be given a separate scale by which to weigh a utility’s requests for higher energy rates, but utilities will also be unlikely to even ask for increased rates since their rates will need to decrease to be competitive with Community Choice programs. But hey, you were promised intrigue and it’s all been economics 101 so far. Fair enough, let’s get to the political maneuvering. To start with, keep in mind that the CPUC and utilities have a less than sterling track record when it comes to transparency. In addition to utilities using illegal lobbying, SDG&E and its fellow investor owned utilities have taken several more active measures attempting to block consumers’ access to choice. I’ll cover three: AB 2145, PCIA, and specific anti-CCE lobbying efforts. AB 2145 was a 2014 California Assembly Bill which proposed changes to Community Choice programs that would have eliminated their initial cost effectiveness by requiring customers to opt-in to Community Choice Energy programs instead of being enrolled automatically into CCE and have the option to opt back to the standard utility supply. That change would have increased startup costs for CCEs to the point where they would be extremely difficult to initiate. The bill was backed by all major investor-owned utilities in California and sponsored by assembly member Steven Bradford, who spent 12 years as a public affairs executive at Southern California Edison. Thankfully, due to grassroots efforts (including by SanDiego350) and the actions of the two CCEs that were already operational, the bill was defeated. So, if you thought the last election cycle was bloated with fake news, just wait until you see what SDG&E’s lobbying arm comes up with. Next in the list of underhanded attempts to block CCEs is the Power Charge Indifference Adjustment (PCIA). On the surface, the PCIA is fairly reasonable—although California is the only state with CCEs to allow this type of fee. The PCIA is a charge used to pay for existing long term power contracts that utility has already signed. The issue is the way utilities have lobbied for PCIA fee increases. In November of 2015 PG&E requested that the CPUC double the PCIA fee for Marin Clean Energy customers. The possibility that PG&E’s departing load costs doubled from 2015 to 2016 strains credulity, but is impossible to verify since the CPUC allows utilities to provide heavily redacted, unaudited calculations as justification for increases. Such oversight is similar to no oversight at all, and sadly, the CPUC allowed the increase. 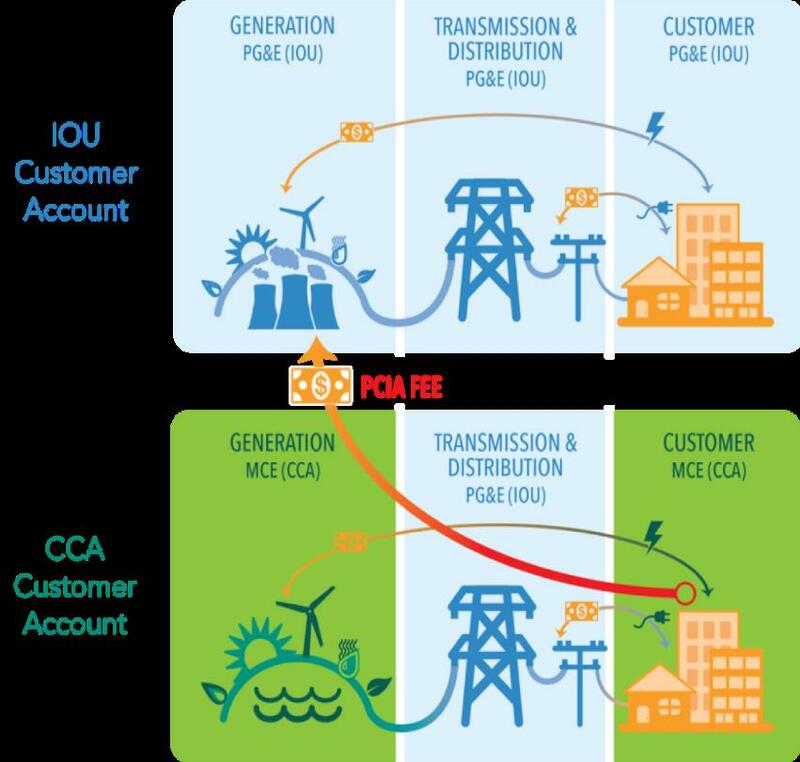 Finally, PCIA fees are allowed as an unending monthly charge instead of tapering off as a function of the number of customers served by CCEs and the expiration of long term power purchase agreements. CCEs and community advocates have noted that PCIA fee transparency is a top priority and are working hard to promote change in this area. On August 19, 2016, the Public Utilities Commission sided once again with the utilities and approved the lobbying arm. So, if you thought the last election cycle was bloated with fake news, just wait until you see what SDG&E’s lobbying arm comes up with. But, speaking as a little brother myself, I have a message for the utility companies: we may be little, but this is one fight we will never give up. Now that you know about Community Choice Energy/Aggregation and the forces arrayed against it, here is your chance to make a difference. Call your city council members and tell them you want Community Choice Energy. They are the ones with the power to start the ball rolling and ultimately vote to implement a program. In the City of San Diego the feasibility study is underway, but that doesn’t guarantee a CCE will be established. If you live in the City of San Diego here is a map showing which council member represents you and the council member’s contact info. It wouldn’t hurt to let Mayor Faulconer know your thoughts as well. If you live elsewhere in California you can likely still make a difference by contacting your own city or county representatives. Locally, some cities in North County, the County of San Diego and La Mesa are also considering CCE programs. Tell your representative your story. Make it personal. For instance, members of my family have struggled with asthma. Asthma rates rise significantly in areas polluted by fossil fuels. Even if there were no other reasons to opt for clean energy (there are), even if clean energy were more expensive (it isn’t), it would still be worthwhile to make the switch so that far fewer children have to experience the throat-clutching terror of an asthma attack. Community Choice Energy gives us a chance to make the world a better place. Let’s make sure that that choice is available. — Solar and wind power don’t require pipelines bearing oil or gas. Politicians are pretty good at arguing for the lowering of taxes, and not so good at arguing for lowering energy costs, which are structured on grossly inflated incomes for energy execs and lobbyists. Make ’em feel the burn. That’s a good point. Currently there are no active CCE programs in the SDG&E service area. Soon that should change. The City of Solana Beach will likely be the first CCE program in SDG&E territory, although several areas are taking a look at implementing a CCE. Click on the link in the caption for the map to get to the Clean Power Exchange site. There they detail CCE efforts in each region. We struggled with a reasonable plan to put solar on the roofs of our condo complex. It turned out not to be feasible; there was no infrastructure out there to make it feasible or practical. Owners would have had to sign a 20 year lease. Then what if they wanted to sell? The new buyer wasn’t obligated to maintain the lease. There needs to be a uniform plan out there for condo complexes and apartment buildings that would encourage solar installation.